The issue of civilian losses and casualties is heart-rending therefore the Islamic Emirate is deeply concerned regarding this issue due to its duel religious and national responsibility. The Islamic Emirate is deeply committed to preventing civilian losses and casualties in the ongoing Jihadi struggle and, if God-forbid, Mujahidin are involved in such negligence with civilian lives, it would never be admissible and tolerable for the Islamic Emirate. Therefore a separate and autonomous organ for the preventions of Civilian Losses and Casualties and Attending Grievances has been established by the Islamic Emirate for the purpose of controlling, recording and referring such cases to relevant courts so that the one hand such incidents are seriously and legally dealt with and the perpetrators are held accountable and on the other hand, the civilian people are safeguarded from becoming victims of fighting and conflicts in the future. In addition it is also the responsibility of this organ to evaluate and investigate the data and incidents caused by the wicked foreign invaders, the so called security organs of Kabul administration and other mischievous and criminal groups, which has multiplied the sorrows and afflictions of our innocent countrymen. According to the decree and direction of the leadership of the Islamic Emirate, it is obliged on the above mentioned organ to register and record all incidents of civilian losses and casualties with accuracy, neutrality and a deep sense of responsibility; to point out the perpetrators of the incidents; to evaluate the amount and details of damage; and to dispatch these authentic reports to the office of the leadership of the Islamic Emirate and other relevant legal organs periodically. This initiative has several benefits. Firstly it will lend a helping hand in taking due legal action against the perpetrators of civilian losses and casualties while our own people, the world community and all those organs which are either seriously concerned about civilian incidents or honestly interested in preventing these casualties will be duly kept informed about the nature of these incidents and their real perpetrators and the deep sense of responsibility felt by the Islamic Emirate regarding these incidents. Secondly it is hoped that the publication of these accurate and neutral reports will significantly help in reducing and preventing the regretful phenomena of civilian losses and their casualties. The organ of the Islamic Emirate for the prevention of civilian losses and casualties assures that this report is prepared and based on authentic evidences and no negligence and forgiveness has been adopted in any single incident. This organ recurrently demands all those individuals and groups who periodically express their concerns about the gravity of civilian losses and casualties to play even greater role in identifying the perpetrators of these incidents, in condemning them and their due punishment in the least possible time. Of course, the concerned legal organs of the Islamic Emirate have left no stone unturned to trial and punish the perpetrators of incidents which are committed under the jurisdiction of the Islamic Emirate, regardless of their affiliation with the Islamic Emirate. On various occasions, the perpetrators of such incidents have been introduced and handed over to relevant courts which, in their turn, have taken all necessary steps in penalizing them. Parallel with previous years, the first six months (i.e. January, February, March, April, May and June) of the year 2017 were also fraught with fatal incidents of civilian losses and casualties. Overall 404 tragic incidents of civilian losses and casualties have been recorded by the organ of the Islamic Emirate for the prevention of civilian losses and attending grievances from all parts of the country through its own reporters, free media sources, local chieftains and other local eye-witnesses. Among these 404 incidents, American invaders, the mercenary army, police and Arbaki militiamen of the stooge admin are involved in 296 incidents; 60 of these incidents have occurred due to Mujahidin’s negligence and Daish (i.e. ISIL) and some other unknown groups are responsible for 48 incidents. In this way the American invaders and their stooge setup in Kabul is held responsible for 73.26% of total civilian incidents in the last six months; Mujahidin of the Islamic Emirate are involved in 14.85% of these incidents; while 11.88% of these incidents are caused by ‘Daish’ and other mischief-mongers. In these 404 incidents, overall 689 civilian countrymen were martyred; among them 495 were men, 84 were women and 110 were children. In these 689 martyred civilians, 424 people were martyred by the American invaders and their related mercenary army, police and Arbaki militiamen; 84 people were martyred due to Mujahidin’s negligence; while the remaining 181 people were martyred by ‘Daish’ and other unknown groups. According to the above figures, Americans invaders and the stooge Kabul admin is responsible for 61.53%; Mujahidin of the Islamic Emirate are involved in 12.19%; while the remaining 26.26% civilian martyrs are caused by ‘Daish’ and various other unrestrained groups. Of the total 404 civilian incidents, 1041 innocent countrymen were injured; among them 781 were men, 78 women and 182 were children. Among the above 1041 civilians, 459 were injured by the American invaders and their mercenary forces; consisting of 309 men, 54 women and 96 children. Of the total 1041 civilians injured, 62 people were injured by Mujahidin; consisting of 41 men, 10 women and 11 children. Of the total 1041 injured people, 521 civilians were injured by ‘Daish’ and other unknown groups; consisting of 505 men, 3 women and 13 children. American invaders and their mercenary forces are responsible for 44.09% injured civilians people. Mujahidin are responsible for 5.95% civilians injured. ‘Daish’ and other groups are responsible for 50.04% civilians injured. The organ for the prevention of civilian losses and casualties presents the examples of some significant instances in which the civilian people and their houses were explicitly targeted by the brutal foreign invaders and their internal mercenary forces, resulting in huge financial losses and casualties for the innocent people. On Thursday 9th February 2017, reporter of the organ for the prevention of civilian losses reported that the house of an innocent civilian (name ‘Fida Mohammad) was brutally bombed by air forces of the savage foreign invaders in ‘Chinari’ area of ‘Sangin’ district in ‘Helmand’ province in which 13 members of his family were martyred. The list of the martyred consists of ‘Fida Mohammad’, four of his sons (named ‘Mohammad Wali’, ‘Khan’, Naseebullah’, ‘Pacha Agha’), two of his wives, four of his daughters, one daughter in law and one nephew. Similarly, on the same night, another civilian house belonging to a villager named ‘Bacha Aka’ was indiscriminately bombed in ‘Matay Lakary’ area of ‘Sangin’ district of this province in which nine members of his family were brutally martyred. The list of these martyred people consists of six of his sons (named ‘Fouji’, ‘Sate’, ‘Agha Lalay’, ‘Razi Gul’, ‘Sultan Aziz’, ‘Mohammad Mir Waise’), two of his daughters and one wife. On the same night, the mosque of ‘Haji Salih Mohammad’ in ‘Lambano’ area of ‘Sangin’ district of this province was indiscriminately bombed by the brutal foreign forces in which the holy mosque was completely destroyed but luckily no loss or casualty was reported from there. On Thursday 2nd March 2017, reporter of the organ for the prevention of civilian losses reported that a civilian house in ‘Malkhail’ area near ‘Algea Bazaar’ of ‘Arghandab’ district of ‘Zabul’ province was targeted by the air forces of savage foreign invaders. According to this report, 9 men, 2 women and two children of one and the same family were martyred in this tragic incident, while 3 more children were seriously injured. On Friday 3rd March 2017, it was reported that at 3 pm in the afternoon, 20 civilian people were martyred and injured in the indiscriminate bombing of savage foreign invaders in ‘Tapa-e-Saadat’ area of ‘Farah Raud’ district in ‘Farah’ province. This untoward incident took place when the operational forces of the enemy came under Mujahidin’s severe attacks in the area. The embarrassed and defeated enemy then resorted to targeting the civilian populated areas by indiscriminate mortar shelling and savage aerial attacks. The civilian people then tried to move their families including women and children to another comparatively safer area. In the meantime, a vehicle was targeted by the enemy helicopters in which 8 children were martyred on the spot and 12 persons including women and children were seriously injured. A child of ‘Abdul Bari’. A child and a daughter of ‘Haji Ghulam Nabi’. Two female children of ‘Musa Aka’. Two male children and one female child of ‘Lal Mohammad’. On Thursday 2nd March 2017, reporter of the organ for the prevention of civilian losses and casualties reported that following heavy fighting in ‘Todang’ area of ‘Farah Raud’ district in ‘Farah’ province, civilian houses in the area were indiscriminately targeted and hit by heavy weapons in which a number of civilian people were martyred and wounded. The house a local resident, named ‘Qasim’ was consecutively hit by four mortar shells in which he himself was injured and his child was martyred, while the house and various other things were completely destroyed. Similarly, two female children of another local dweller named ‘Dawood’ were injured and his house was also damaged. According to this report, two other local residents named ‘Abdul Manan’ and ‘Abdul Sattar’ sons of ‘Khudai Ram’ were seriously injured in the random shelling of the enemy. Similarly, another white-bearded villager named ‘Haji Rahmuddin’ was also injured in this incident. In another likewise incident, one civilian along with two children and a women were seriously injured. In a separate incident, a 12-year-old boy riding his bicycle was hit by the random shelling of the enemy in ‘Siya-Jungle’ area of the above district and was martyred. It is worth mentioning the premises of various other houses and civilians belongings were badly damaged in these separate incidents. On Friday 17th March 2017, the reporter of the organ for the prevention of civilian losses and casualties noted that house of newly released civilian prisoner was raided by the savage foreign invader in collaboration with their internal mercenary forces in ‘Kalankichi’ area of ‘Maiwand’ district in ‘Kandahar’ province. This poor prisoner was set free just 20 days earlier and it was his wedding night. He and 5 other participants of the wedding party were brutally martyred in the raid while 10 other innocent villagers were kidnapped and taken away as prisoners by the savage foreign invaders. On Sunday 28th March 2017, our media reporter said that 3 civilian countrymen were targeted and hit at 11 o’clock at noon in an indiscriminate drone strike of the enemy in ‘China Manda Dasht’ area of ‘Sangin’ district in ‘Helmand’ province. On Thursday 2nd March 2017, worker of the organ for the prevention of civilian losses and casualties reported that 3 innocent civilians who were out hunting were hit and martyred in an indiscriminate drone strike of the savage foreign invaders in the hills of ‘Kunj-Ghatu’ in ‘Araban’ area of ‘Chak’ district in ‘Maidan Wardak’ province. Two of martyred people, named ‘Naseeb Rahman’ s/o of ‘Naranj Gul’ and his nephew ‘Naseer Rahman’ were the dweller of ‘Kunj-Ghatu’ area, while another civilian, named ‘Ihsanullah’ was the dweller of ‘Gand-Kole’ area. The later one was also the relative of the above two persons. On Monday 2nd January 2017, the representative of the organ for the prevention of civilian losses and casualties reported that the house of a civilian person named ‘Abdul Hameed Akhunzada’ was hit in the random mortar shelling of the enemy in ‘Shiwan’ area of ‘Bala Baluk’ district of ‘Farah’ province in which his grandchild (female) was martyred on the spot while two others, a grandchild (female) and a daughter, were seriously injured. It is worth mentioning that no movements or operations of Mujahidin were visible at the time when this untoward incident occurred. On Sunday 15th January 2017, our correspondent reported that the house of an ordinary civilian name ‘Torjan’, the dweller of ‘Jalat Khanzo’ area was hit by a mortar shelling randomly fired by the enemy forces during a fighting with Mujahidin in ‘Kunsak’ area of ‘Bala Baluk’ district of ‘Farah’ province in which 3 of his family members were martyred on the spot. Similarly another white-bearded villager named ‘Akhtar Jan Aka’, the dweller of ‘Jalezo’ area of this district was also injured in the random shelling of the enemy and was subsequently martyred due to his injuries. In a separate incident, the house of ‘Abdullah’, the dweller of ‘Jalezo’ area was hit in a random shelling of the enemy in which 4 members of his family (a son, a daughter, a daughter-in-law and his own wife) were seriously injured. On Monday 30th January 2017, correspondent of the organ for the prevention of civilian losses and casualties reported that 17 civilian people including women and children were martyred and injured in the indiscriminate mortar and helicopter shelling of the enemy in ‘Shiwan’ area of ‘Bala Baluk’ district of ‘Farah’ province. According to the reporter, this tragic incident took place when the enemy forces entered the area with heavy earthmoving machinery and bulldozers to destroy the houses and shops of civilian people in the area. In the meantime, the enemy was confronted by stiff resistance of Mujahidin of the Islamic Emirate in the area. During the fighting, the house of an innocent civilian named ‘Haji Mohammad Khan’ was hit by randomly fired SPG-9 shelling in which 8 people were injured including women and children. Similarly, the house of another local civilian named ‘Razo Aka’, was hit indiscriminately by the enemy’s helicopters in which his mother and wife were badly injured. In the above helicopter shelling, a child named ‘Ibrahim’ son of ‘Mirza’ and another child, son of ‘Karim Jan’, were also injured. Another dweller of the area named ‘Khudai Nazar’ was also injured in the indiscriminate aerial shelling of the enemy. On Monday 24th April 2017, the correspondent of the organ for the prevention of civilian losses and casualties reported that 3 women of a family were martyred while a child and a woman were injured and taken away as prisoners along with 2 other innocent civilians during a joint raid of savage foreign invaders and their internal mercenary forces in a village near ‘Gazi’ area of ‘Khak-i-Afghan’ district of ‘Zabul’ province. On Thursday 19th January 2017, reporter of the organ for the prevention of civilian losses reported that 2 sons of a local civilian named ‘Abdul Rasheed’ were martyred and another child, son of ‘Abdul Ghaffar’, was badly injured in ‘Soor’ area near the center of ‘Farah’ province. This untoward incident took place while these boys were grazing their animals in the fields when a randomly fired shell hit the field resulting in these civilian losses. On Sunday 1st January 2017, our correspondent of the organ for the prevention of civilian losses and casualties reported that the house of a local civilian named ‘Abdul Mannan’, (in ‘Kaka Khail’ village of ‘Qala Gaz’ area in ‘Gerishk’ district of ‘Helmand’ province) was hit by an indiscriminately fired mortar shelling of the amateurish army soldiers of the stooge admin of Kabul in which 8 members of his family were martyred and injured. In this tragic incident, one of female child was martyred and 5 of his sons (named Naqeebullah, Ismatullah, Izatullah, Abdul Malik and Mohammad Naseem) and two of his wives were seriously injured. On Tuesday 23rd May 2017, reporter of the organ for civilian losses and casualties reported that the center of ‘Daraboom’ district in ‘Badghis’ province was attacked and liberated by heroic Mujahidin of the Islamic Emirate. Subsequently, to rescue their besieged soldiers and recapture the district center, additional forces of the enemy were sent to the area and the nearby villages and civilian houses were brought under heavy mortar and artillery shelling in which several innocent people were martyred and injured while heavy financial losses were inflicted on them. According to the reports, 22 people were martyred and 15 other were badly injured in this incident both including women and children. Lal Mohammad, his wife niece and daughter-in-law (the dwellers of ‘Kharbada’ area of this district), a son of Zareen, Abul Wali son of Asal, Ismat son of Amir, a daughter of Akhtar, 9 children 2 way farers and 4 other civilians whose names were not received have been martyred in this tragic incident. Similarly, Haji Momin Khan, his wife, his daughter-in-law, his 12-year-old daughter, his 7-year-old son and 10 other people, most of them children, were injured in the above incident. On Thursday 12th January 2017, correspondent of the organ for the prevention of civilian losses and casualties reported that the house of a local civilian (name ‘Haji Hazrat Khan’) was raided by brutal American occupiers and their internal mercenary forces in 26 number canal area of ‘Ghani Khail’ district in ‘Nangarhar’ province in which 4 children of this family and 3 guests were martyred while 7 other people including an injured person were taken away as prisoners. Moreover the main gates of civilian houses were destroyed with bombs while cash and significant amount of valuables were stolen from the houses. On Wednesday 8th March 2017, our correspondent reported that a vehicle of local chieftains was indiscriminately hit in a drone strike of brutal foreign invaders in ‘Esa Khail’ area of ‘Char Dara’ district in ‘Kunduz’ province in which 5 civilian chieftains (named Abdul Majeed s/o Afzal, Haji Abdul Rauf s/o Abdul Hameed, Abdul Mohammad s/o Sheikh Mohammad, Mohmmad Tali s/o Haji Sultan, Teacher Khudai Dad s/o Mohammad Nazar- all aging between 50 and 70 years) were martyred on the spot. According the report, these chieftain had gone to another area to judge a local dispute but they became victims of this savage attack while returning their homes. On Wednesday 1st February 2017, correspondent of the organ for the prevention of civilian losses and casualties reported that after heavy fighting between Mujahidin and mercenary forces of puppet regime in ‘Maidani’ area near ‘Mehtarlam’ city, the center of ‘Laghman province, civilian houses were brought under indiscriminate mortar shelling by the wicked enemy in which 3 women of a local resident named ‘Noor Mohammad’ and the wife of another civilian named ‘Stana Gul’ were martyred, while 3 more women and 4 men (named Nasrat s/o Haider, Jamil s/o Gul Rahman and Akram s/o Shakoor) were seriously injured. On Thursday 2nd March 2017, our correspondent reported that civilians were indiscriminately bombarded by jet fighters of brutal foreign invaders in ‘Qamguzar’ area of ‘Darqad’ district in ‘Takhar’ province in which 5 innocent people including 2 children were martyred while 7 others were badly injured. On Saturday 22nd April 2017, our correspondent of the organ for the prevention of civilian losses and casualties reported that civilian houses in ‘Esa Khail’ area of ‘Chardara’ district in ‘Kunduz’ province were raided by savage foreign invaders escorted by their internal mercenary forces in which 2 civilian people (Abu Bakr s/o Muhammad Amir and his mother) were martyred and 3 other civilians (named Mohammad Samir, Mohammad Amin, and Mohammad sons of Mohammad Amir) were injured. On Monday 22nd May 2017, reporter of the organ for the prevention of civilian losses and casualties reported that houses of civilian people were raided by brutal foreign invaders and their internal mercenary forces in ‘Second Farm’ area of ‘Bati Kot’ district in ‘Nangarhar’ province. During this raid, the entire area was indiscriminately bombarded in which 5 civilian countrymen including 3 children were martyred and 9 other innocent people were injured. Similarly one vehicle was destroyed and more than 50 sheep killed as well as several houses and crops in the fields were badly damaged. On Sunday 25th June 2017, on the happy occasion of ‘Eid-ul-Fitr’ (festivities marking the end of Ramadan i.e. the holy fasting month of Muslims) free media sources reported that 16 innocent people of one family were martyred in the indiscriminate bombing of savage American invaders in ‘Pekha Tangi’ area of ‘Achin’ district in ‘Nangarhar’ province. The news added that the pictures of those who were martyred in this barbaric bombing were also shared and published on social media. 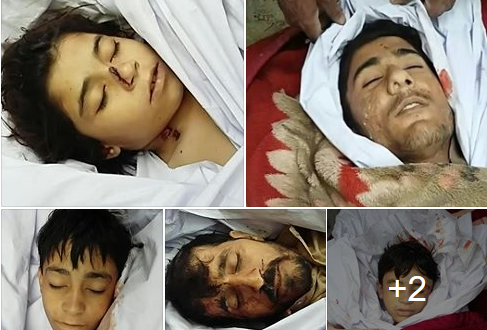 In addition, news agency of ‘Daish’ group (named ‘Amaaq’) also confirmed this tragic incident and published pictures of the children who were martyred. But the so called defense ministry issued a report which said that 12 armed opponents were killed while 7 of their hideouts were destroyed in the aerial bombing of Afghan forces in ‘Achin’ district of ‘Nangarhar’ province. On Monday 19th June 2017, reporter of the organ for the prevention of civilian losses and casualties reported that houses of civilian people were raided by savage American invaders in collaboration with their internal mercenary forces in ‘Siya-Chobe’ area of ‘Ghani Khail’ district in ‘Nangarhar’ province in which the main gates of several houses were destroyed with bombs, houses were ransacked, significant amount of valuables were looted and 5 civilians working in a nearby chicken farm were martyred and 5 others taken away as prisoners. On Monday 13th February 2017, our media correspondent reported that a civilian driver was brutally martyred by the stooge enemy soldiers in ‘Toot Chakao’ area of ‘Farah Raud’ district in ‘Farah’ province. This untoward incident occurred when a civilian drive (named Naqeebullah, resident of Helmand province) was driving his transport vehicle from Kabul to Farah province. He was stopped at a check-post and a significant amount of bribe money was taken from him. In the meantime a verbal spat took place between him and the local (in)security personnel, who opened fire on him and martyred him on the spot. On Saturday 3rd March 2017, reporter of the organ for the prevention of civilian losses and casualties reported that 2 ordinary countrymen were martyred in the indiscriminate bombing of the savage foreign invaders in ‘Aladi Tangi’ area of ‘Arghandab’ district of ‘Zabul’ province. According to this report these civilian people were busy in irrigating their fields when they became the victims of savage bombing of the enemy resulting in this tragic incident. On Saturday 18th March 2017, our correspondent reported that houses of civilian people were indiscriminately bombed by the enemy helicopters after a fighting took place in ‘Khawaj Qishri’ area near ‘Juma Bazaar’ district of ‘Faryab’ province in which 10 civilian houses and a mosque were badly damaged while 2 innocent people of a family (named ‘Rustam’ and his wife) were martyred. On Friday 24th March 2017, reporter of the organ for the prevention of civilian losses and casualties reported that several innocent countrymen were martyred and injured in the indiscriminate mortar shelling of the mercenary forces in ‘Ghanj Abad’ area of ‘Bala Baluk’ district in ‘Farah’ province. The house of a civilian (named Mohammad Zarif Aka, resident Shiwan area) was hit in one of the random mortar shelling of the stooge in-security forces in which he himself was martyred and 3 of his children were badly injured whereas another white-bearded civilian (named Faiz Mohammad Aka) was targeted from a military tank of the enemy and was martyred on the spot. On Thursday 30th March 2017, our correspondent reported that the amateurish soldiers of stooge Kabul admin opened indiscriminate fire on 2 children who were playing at a playground. One of them (son of Mir Ahmad) was martyred on the spot and the second one (son of Muladad) was badly injured. On Saturday 15th April 2017, our media reporter reported that an innocent white-bearded civilian was martyred and a child was seriously wounded in the random mortar shelling of stooge enemy in ‘Buland Ghore’ area of ‘Sayyad’ district in ‘Saripul’ province. Similarly, civilian houses in ‘Pusta Mazar’ area of the above district were indiscriminately hit by mortar shelling of the mercenary enemy in which 3 people of a family including women and children were martyred. On Wednesday 19th April 2017, our correspondent of the organ for the prevention of civilian losses and casualties reported that fighting took place between Mujahidin and the mercenary soldiers of stooge Kabul admin in ‘Ghondi’ area of ‘Shilgar’ district in ‘Ghazni’ province which lasted for two hours. Later, the surrounding area was indiscriminately hit by mortar shelling of the soldiers. The house of a civilian (name Mohammad Nazar) was hit in this random shelling in which his daughter-in-law and a grandson were martyred and 3 other children were injured. On Thursday 4th May 2017, reporter of the organ for the prevention of civilian losses and casualties reported that civilian houses were targeted in the random mortar shelling of amateurish soldiers of puppet regime of Kabul in ‘Qara Ghaweli’ area of ‘Almar’ district of ‘Faryab’ province in which one civilian (named Khair Mohammad s/o Haji Pir Mohammad) was martyred and his wife and one sister were wounded. Similarly, another civilian countryman (named Ismaeel) was also injured in the incident. On Saturday 3rd June 2017, our correspondent of the organ for the prevention of civilian losses and casualties reported that enemy’s check-posts were brought under severe attacks by Mujahidin in ‘Ahmad Khail’ area of ‘Jalraize’ district in ‘Maidan Wardak’ province. In retaliation, the enemy helicopters indiscriminately targeted the house of a civilian countryman (named Gul Khan) in which 2 of his children were martyred and 7 other people including 2 children and 5 women were badly injured, in addition to the heavy financial losses inflicted on him. On Wednesday 14th June 2017, reporter of the organ for the prevention of civilian losses and casualties reported that the house of a civilian (named Ghulam Hazrat) was hit by mortar shell randomly fired by the enemy forces in ‘Shaikh Abad’ area of ‘Said Abad’ in ‘Maidan Wardak’ province in which 2 of his daughters were martyred and one of his son was wounded. On Wednesday 4th January 2017, our correspondent reported that a residential area was hit by a randomly fired mortar shell of the stooge enemy soldiers in ‘Kandiri’ area of ‘Pachir Agam’ district in ‘Nangarhar’ province in which 2 children and a woman were martyred. On Tuesday 14th February 2017, reporter of the organ for the prevention of civilian losses and casualties reported that two civilian houses were hit by randomly fired grenades in ‘Zargarano’ area near the central city of ‘Laghman’ province in which 2 children (named Nabiullah s/o Sadullah a daughter of Hafta Gul), were martyred in both houses, and a daughter of Saeedullah and a son of Mian Nawaz were badly wounded. On Wednesday 15th March 2017, reporter of the organ for the prevention of civilian losses and casualties reported that houses of civilian people were indiscriminately bombed by the savage foreign invaders in ‘Madrassa’ area of ‘Yateem’ village in ‘Chahar Dara’ district of ‘Kunduz’ province in which 4 innocent countrymen (Abdul Satar s/o Haji Jaleel and his son Akhtar Mohammad, his wife and a daughter-in-law) were martyred, while 4 members of his family including 3 daughters and a grandson were badly wounded. On Sunday 16th April 2017, correspondent of the organ for the prevention of civilian losses and casualties reported that a civilian house was hit by a randomly fired mortar shelling of the mercenary in-security forces in ‘Shaidakan’ area of ‘Tagab’ district in ‘Badakhshan’ province in which 2 children of one family were martyred while 2 other children and a woman were injured. On Friday 28th April 2017, reporter of the organ for the prevention of civilian losses and casualties reported that civilian residential area was hit by a mortar shelling randomly by the mercenary forces of stooge regime after a confrontation between them an Mujahidin of the Islamic Emirate in ‘Kohi’ area of ‘Zurmat’ district in ‘Paktia’ province in which a white-bearded man (named Haji Mohammad) and a female child were martyred and another female child was wounded. On Tuesday 23rd May 2017, correspondent of the organ of civilian losses and casualties reported that houses of civilian people were raided by the savage foreign invaders and their internal mercenary forces in ‘Gulahi’ area ‘Ghani Khail’ district in ‘Nangarhar’ province in which 3 children were martyred. On Tuesday 6th June 2017, reporter of the organ of prevention of civilian losses and casualties reported that a civilian house was hit in an artillery shelling randomly fired by the amateurish forces of the puppet regime in ‘Aqibai’ area of ‘Imam Sahib’ district in ‘Kunduz’ province in which 2 women (wives of civilian people, named ‘Abdul Fatah’ and ‘Kashar Gul’) were martyred. On Tuesday 6th June 2017, our correspondent reported that a civilian house was hit by an artillery shelling indiscriminately fired by the mercenary forces of stooge set up in ‘Bakhmal’ street near ‘Imam Sahib’ district of ‘Kunduz’ province in which 3 innocent people, Said Mohammad, his wife and his nephew were martyred. On Sunday 4th June 2017, reporter of the organ for the prevention of civilian losses reported that a road side mine was struck a military tank of a supply convoy in ‘Sabar’ area near ‘Pachir Agam’ district of ‘Nangarhar’ province. After the incident, the local bazaar of this area was brought under indiscriminate mortar shelling by the enemy forces in which 3 civilian people inside the bazaar (Zabit, his son and another civilian) were martyred, while 10 more people most of them local shopkeepers were injured. On Sunday 2nd July 2017, our correspondent of the organ for the prevention of civilian losses and casualties reported that ‘Nakar Khail’ area near ‘Khogyani’ district of ‘Nangarhar’ province was raided by the savage foreign invaders in which a woman and 2 children were martyred and a civilian house was completely demolished. On Monday 12th June 2017, reporter of the organ for the prevention of civilian losses and casualties reported that 3 innocent people, a father and two of his sons, were martyred by the brutal foreign invaders in ‘Kama’ area of ‘Ghani Khail’ district of ‘Nangarhar’ province. According to the report, a road-side mine hit a military tank of American soldiers inflicting losses and casualties on them. Later, the embarrassed and brutal foreign soldiers opened indiscriminate fire in retaliation on a father and his two sons (named Zairi Gul, Ashraf and Zahid respectively) working in a brick-kiln, who were martyred on the spot, while another child was injured in this tragic incident too.